In this category you will find the CO2 analyser for the determination of the carbon dioxide content in the air. The CO2 analyser warns optically or acoustically when the carbon dioxide content is critical. Moreover, depending on the model, the CO2 analyser supports the function of switching relays when an adjusted value is exceeded. This function can help with the automatic conditioning of rooms. The auto calibration function of the CO2 analyser makes an easy calibration possible. The CO2 analyser supports the function of data storage and further data transfer of measuring results to a computer. Therefore, it is possible to take long-term measurements in order to capture the carbon dioxide content of a specific place for a longer period. Also, you can find a CO2 analyser for fixed installations. These can be applied individually or inconnected to a gas warning system. The CO2 Analyzer PCE-RCM 12 is used for indicative testing of environmental parameters. The CO2 Analyzer PCE-RCM 12 enables the measurement of CO2, fine dust, temperature and relative humidity. 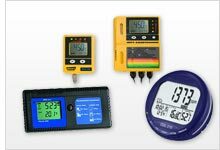 The bright display of the CO2 Analyzer provides information about these parameters. PCE-WMM 50 is a wall-mounted CO2 analyzer that uses diffusion to monitor carbon dioxide (CO2) gas levels and ambient temperature (ºC / ºF) indoors. This indoor air quality meter features an alarm-activated potential-free contact that can, for example, activate a fan to reduce CO2 gas concentration in the room. The CO2 analyzer PCE-AQD 20 is an ideal measuring device for monitoring the air quality at workplaces. The PCE-AQD 20 health and CO2 analyzer is ideal for continuous logging of air temperature, humidity, CO2, PM2.5 and air pressure. CO2 Analyzer Gasman-CO2 "Carbon Dioxide"
The CO2 Analyzer Gasman-CO2 is a unique gas meter which protects against a specific gas, inflammable or toxic. The CO2 Analyzer warns with a penetrating alarm and an optical signal (useful in case when there are loud noises in the surroundings) of the existence of dangerous gas concentrations and shows on screen the value of the gas measurement. The CO2 Analyzer fulfills all the European and international norms, even ATEX and UL standards.